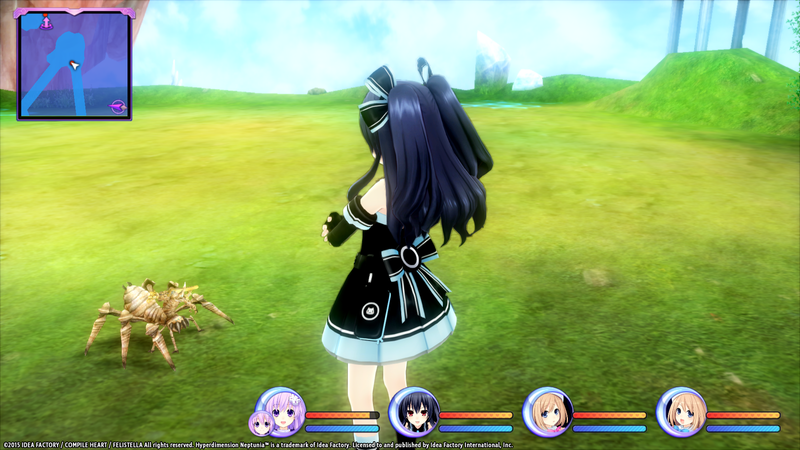 Get ready to revisit Gamindustri and your favorite Goddesses! 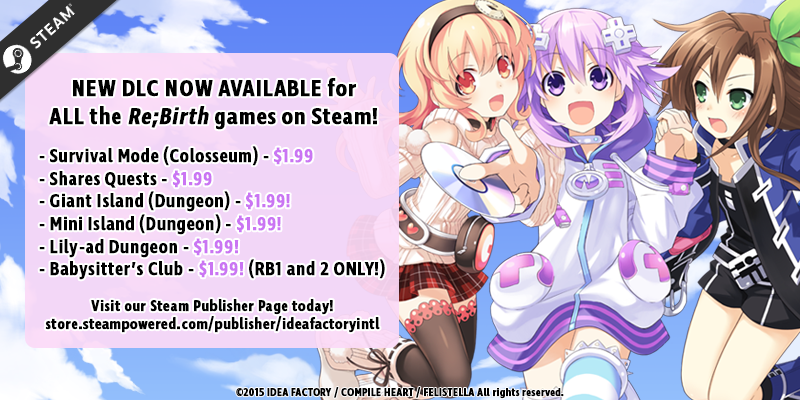 We're happy to announce SIX new DLC are NOW AVAILABLE for the Steam® versions of Hyperdimension Neptunia™ Re;Birth1, Hyperdimension Neptunia Re;Birth2, and Hyperdimension Neptunia Re;Birth3! 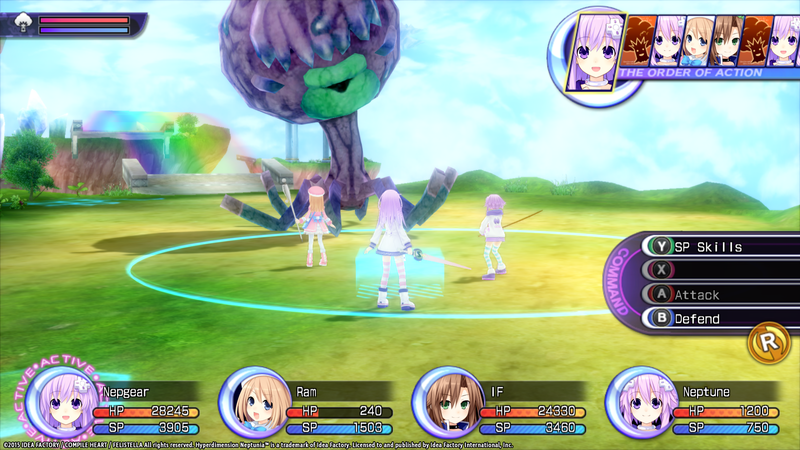 Babysitter's Club - Re;Birth 1 and 2 Only! Survival Mode DLC brings a new nonstop brawl to the games! 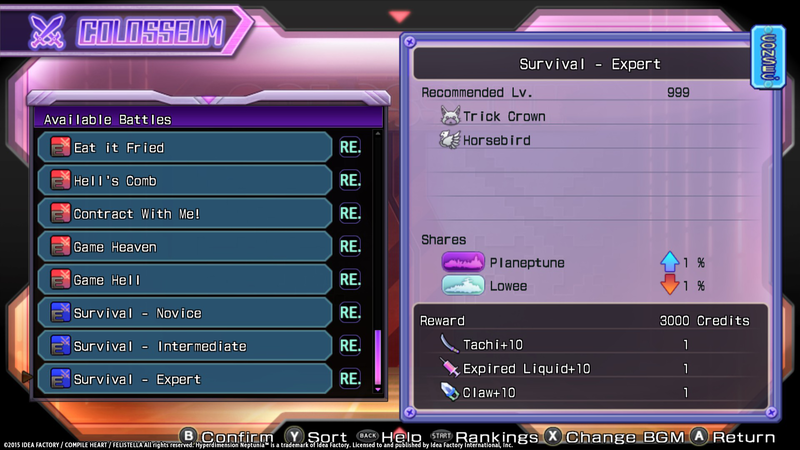 How to Unlock in-Game: Survival Mode will be available upon unlocking the Colosseum in their respective titles. Additional Notes: BGM can be changed during survival mode. Players can pick the BGM or have it shuffle and play at random. 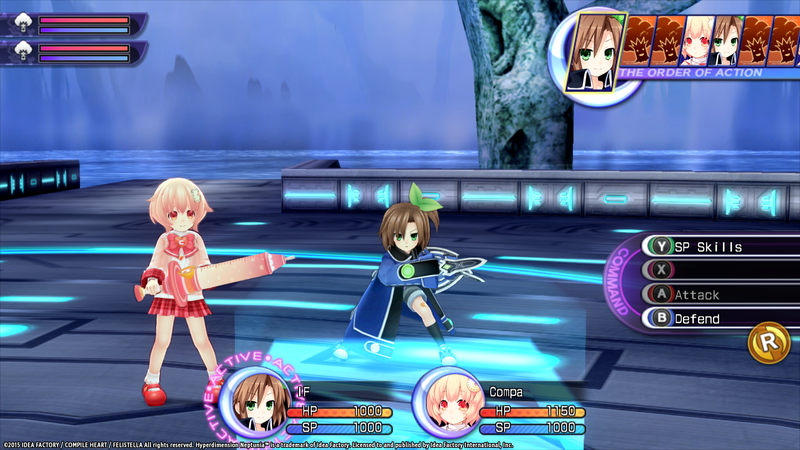 The Shares Quests DLC unlocks one additional quest for Planeptune, Lastation, Lowee, and Leanbox - a total of 4 brand-new quests! How to Unlock in-Game: The Shares Quest DLC can be unlocked from Chapter 8 on your first playthrough and unlocked from the beginning of your second playthrough. The Giant's Island DLC brings exactly that - an island inhabited by stronger enemies! A perfect place to relax in the sun and grind! How to Unlock in-Game: Giant's Island can be unlocked from Chapter 2. The dungeon is unlocked through plans. Mini Island DLC introduces an island dungeon filled with miniature monsters, but with more experience points to gain! How to Unlock in-Game: You can unlock the dungeon through "Plans." 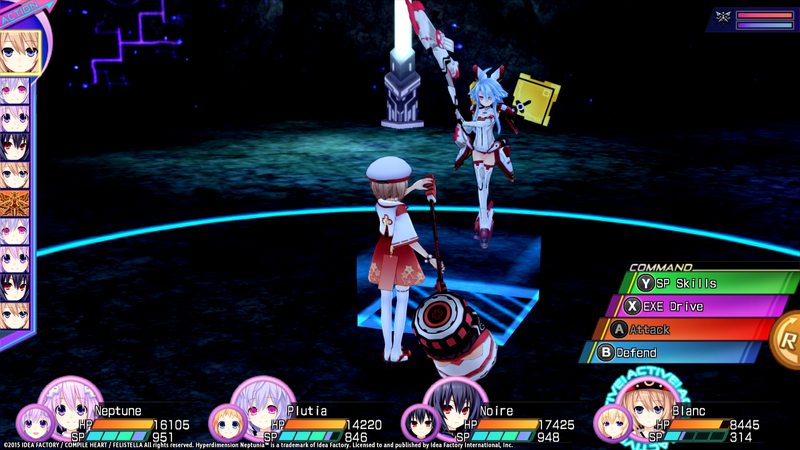 The Lily-ad Dungeon DLC allow players to explore Lily Rank specific dungeons and raise their Lily Ranks at a faster rate! How to Unlock in-Game: Lily Dungeon will be available from Chapter 5 through "Plans". 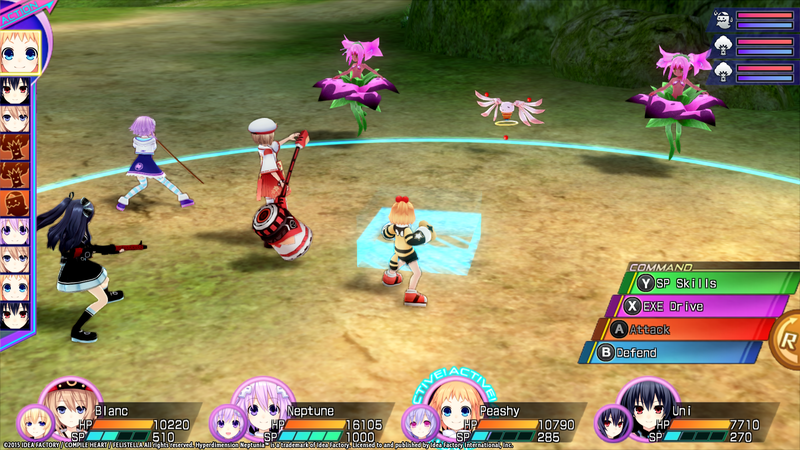 Originally released for Hyperdimension Neptunia Re;Birth1, the Babysitter's Club DLC has made its way to Hyperdimension Neptunia Re;Birth2! You can find all of the DLC at our Publisher Page! Be sure to follow us for more news on our steam games! GMT+8, 2019-4-26 10:19, PE: 0.068295s , QE: 9, Redis On.